Steam the carrots in a steamer or steaming basket with a little water, drain. Puree the chickpeas in a food processor or mixer. Transfer the hummus to a bowl, top with a drizzle of olive oil and a pinch of sea salt. Bake for approx. 1 hr. in the centre of an oven preheated to 180°C. Allow the beetroot to cool, peel and cut into pieces, puree in a food processor or mixer. Add the chickpeas, briefly puree. Transfer the hummus to a bowl, top with a drizzle of olive oil and a pinch of sea salt. Puree the chickpeas in a food processor or mixer. Add the tomatoes, puree until a homogeneous, creamy texture is achieved. Add the tahini, oil, water, lemon juice, tomato puree and spices, briefly puree. 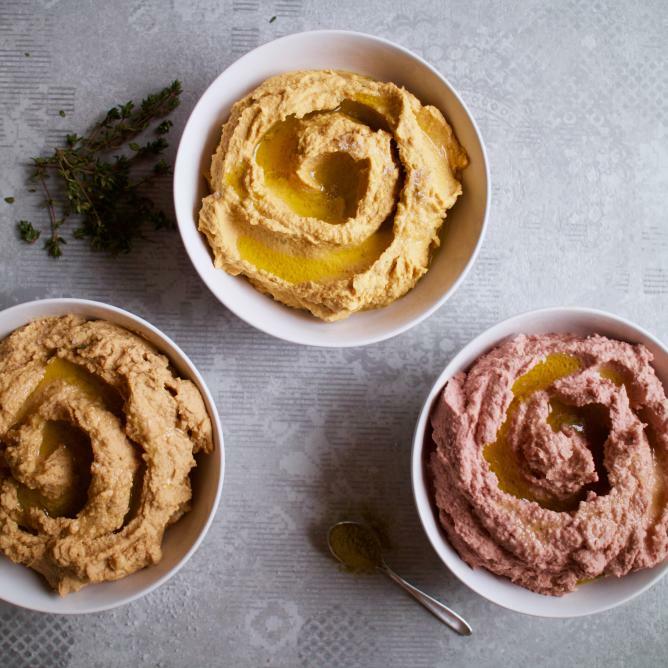 Transfer the hummus to a bowl, top with a drizzle of olive oil and a pinch of sea salt.